100% cotton high quality terry velour golf towels in white. These towels have a tri-fold grommet ideal for use in golf courses, easy to hang. Country club members and golf course visitors rely on white tri-fold golf towels to dry their clubs and golf balls while they're hitting the links. Peak golf season is when most golf towels become frayed, stained and unsuitable to give to your members. Purchasing new white tri-fold golf towels can become expensive as you pay not only for the towel but to have it embroidered as well. It's a repetitive and costly series of events for a simple golf towel. At Towel Super Center, we provide you with high-quality towels at wholesale prices so that you can redirect and use your funds elsewhere. Add a set of our white tri-fold golf towels to your cart today to receive the benefits of our durable golf towel. Absorb moisture and dry fast. Golfers rely on golf towels to dry their clubs and golf balls when hitting the green, especially if they're playing during the early morning or after it rains. Our white tri-fold golf towels absorb a substantial amount of moisture without issue, which lets players continue their game. It also prevents them from drying their clubs or golf balls with their clothes since our golf towels air dry quickly. Store and carry with ease. 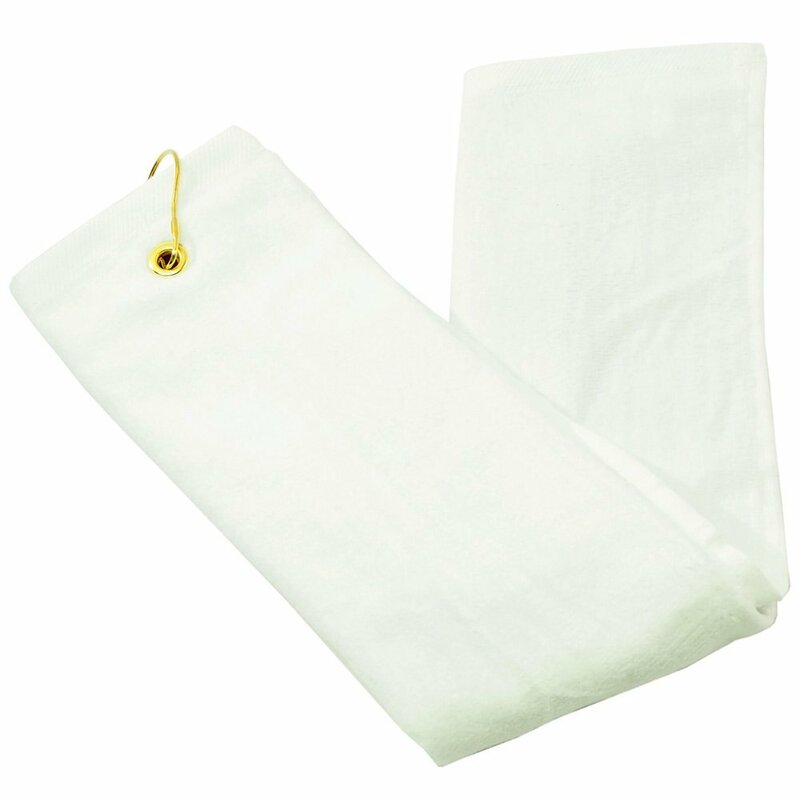 Our white golf towel with a grommet allows players to attach their golf towel to their bag without issue. A grommet also makes it easy for you to store and hang your golf towels. Avoid using a storage bin, cabinet or undercounter space and use your wall instead. Maintain softness and keep coloring. Golf towels often arrive soft and fluffy, but after use, they never capture that same level of plushness. Ours return to their fluffy state after a cycle in the dryer. Soft towels are gentle on golf clubs and prevent scratching. Our white tri-fold golf towels are also bleach-safe, so you can keep them sparkling white for clients. Use cotton and remain durable. Our terry-velour golf towels are 100 percent cotton. Because they use quality cotton, they have dense and long cotton fibers. These fibers prevent fraying, thinning and stretching, which let you use our golf towels for an extended time. The convenient size of our white golf towels with a grommet, 16" x 26", ensures every length and type of golf club is serviceable. Our goal at Towel Super Center is to build lasting relationships with our clients. We want to provide you with long term service, as well as the products that you need for your business. That's why we offer free samples of our white tri-fold golf towels and process your order within one business day. Pick up our white terry-velour golf towel to restock your supply of golf towels today.